On a winter morning, I will probably make myself Peppermint Mocha, but after dinner I am all about Spiked Peppermint Hot Chocolate – made with peppermint schnapps. Peppermint schnapps is a sweet, minty liqueur that I only drink around the holidays. It’s not that I don’t like mint all year round, but much like candy canes, there is something about it that just screams ‘holiday season’ to me and it is the perfect addition to a mug of hot chocolate to make it a little bit more grown up. This year, I used Homemade Peppermint Schnapps (which also makes a nice holiday gift with a container of hot chocolate mix), but it is easy to find at most liquor stores and is fairly inexpensive. You can use any kind of hot chocolate you want – homemade or your favorite mix – and then just stir in the schnapps. It’s easy and delicious, especially if you top yours with a little bit of whipped cream or a few marshmallows and a candy cane. 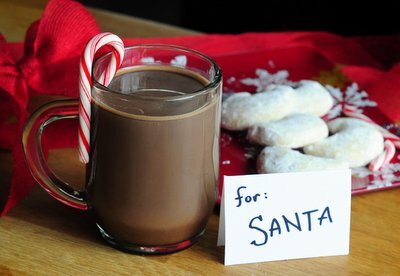 I don’t really think that you need a particular occasion to enjoy a mug of this treat, besides a chilly winter evening, but it just might be the perfect ending to dinner on Christmas Eve – and I bet Santa wouldn’t mind it if you left out a mug for him along with a plate of cookies, too. In a large mug, whisk together milk, cocoa powder, sugar and vanilla extract until smooth. Stir in peppermint schnapps (add an extra 1/2 oz for a stronger drink).